The right type of automation delivers substantial benefits for job shops. The capability to increase spindle utilization and boost output of both people and machines is the most obvious, but improved part accuracy and consistency, reductions in human error and the potential for lights out production—all of which positively affect a shop’s bottom line—should not be overlooked. Because job shops frequently produce parts in smaller and more varied job lot sizes than do larger manufacturers, these often-smaller shops face different challenges, the main one being higher amounts of job change-overs. With this factor in mind, automation best suited for job shop needs will not only emphasize fast and easy setups and reduce job change-over times to 15 minutes or less, but also be adaptable for use from one type of machine to the next. Ideally, shops should plan for automation at the time of machine tool acquisitions. Machines equipped and configured for automation early on can save time and the cost of retrofitting after the fact. Such automation preparedness can include automatic doors, built-in robot interfaces and any other necessary options such as larger tooling capacities and special workholding systems. Or, if future automation needs are uncertain, shops can opt for machines that make adding automation as easy and inexpensive as possible. Once a shop has made the decision to automate its processes, it must evaluate workpiece weight and variation as well as job batch/lot sizes to determine ideal jobs to automate. For instance, jobs that involve small batch sizes of very different part numbers are inefficient and costly in terms of automation. Conversely, high-volume-per-year jobs produced in low-to-medium-volume reoccurring batches at scheduled intervals are ideal candidates for automation, especially when there is little variation in terms of part size, processes and features. Such jobs require fewer job change-overs and have workflows that permit automated cells to run and produce as long as possible between necessary job change-overs. On the other hand, automating for large workpieces requires careful consideration as to how those parts will be presented when loaded and unloaded from a machine tool. Shops must also determine what type of end-of-arm tooling on articulated or gantry robots will be most efficient for the larger parts. Simple fixturing can eliminate having to manoeuvre big parts into complex setups. In these types of production scenarios, shops should avoid multiple sequencing where parts are clamped and unclamped numerous times during processing. Maximizing automation utilization and helping to justify its cost requires careful consideration of how machining cycle times effect up and downstream processes. For instance, when machining large parts with longer machining times, shops can integrate a robot to perform other tasks within peripheral processes while parts are being machined. This configuration may require the robot to ride on rails or travel overhead to serve those other processes and pieces of equipment, or to be positioned to tend several of the same types of machine tools running similar parts. 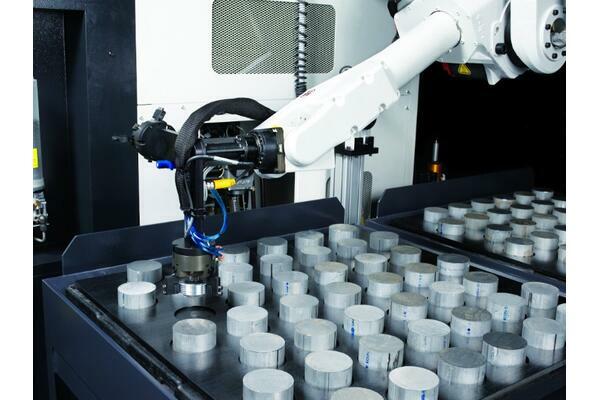 Ideally, shops should plan for automation at the time of machine tool acquisitions. Machines equipped and configured for automation early on can save time and the cost of retrofitting after the fact. Workholding : If the workpiece requires positioning in the chuck or fixture or needs to be aligned in the secondary operation based on features created in the first operation, vision systems or touch probes may be required to complete the task. Gaging : If an unautomated process requires the operator to measure the workpiece during or after machining, automating the gaging process should be considered. Several in-process or post-process options are available, including touch probes, periodic artifact calibration or even use of a post-process gage or coordinate measuring machine. Cycle Times : Cycle times will determine the capacity/size of the queue tables and infeed/outfeed conveyors for finished workpieces. They will also be key in sequencing coordination of additional tasks required of the robot/automation, such as loading to gages, coordinating measuring machines, wash stations, or turn-over stations or simply managing/arranging incoming and outgoing materials on pallets. large enough to eliminate the need for human intervention throughout the entire unattended cycle. redundant tooling. This is particularly true when machining hard materials such as high-temperature alloys or hardened steels. End-of-arm tooling: End-of-arm tooling solutions can be designed using workpiece drawings, material dimensions and weights, sample castings or forgings. Monitoring : While automated operations may eliminate the need for a dedicated machine operator, they still require monitoring. Advanced connectivity, such as through MTConnect, provides the capability to remotely monitor the system as well as troubleshoot and diagnose problems. Job shops have many automation options to achieve their goals. Solutions range from pre-engineered to customized systems, both of which are scalable in size, cost and capability. Pre-engineered solutions cover a broad range of process requirements and can enable a job shop to quickly increase productivity and improve the bottom line. Shops with more sophisticated needs, such as automating multiple machines, part transfers to peripheral operations, or the handling of large, heavy or cumbersome parts, can benefit from customized solutions such as articulated robots. Built-in, two-pallet changers provide simple, self-contained automation that allows parts to be loaded and unloaded without having to interrupt machining operations. Bar feeders are one of the simplest, most cost-effective forms of automation available and are used to automate the loading and feeding of bar material into a CNC lathe with built-up area required. Gantry loaders provide fast, high-production loading and unloading during chuck and shaft work. The systems are easy to install and operate, and provide a quick, turnkey solution that helps shops immediately increase productivity. Mazak’s Multi-Pallet Pool (MPP) system is a compact multiple pallet stocker system ideal for manufacturers who require basic automation to increase productivity and/or have limited floor space that prevents installation of a system with a horizontal pallet stocker. It’s an expandable system that allows shops to initially incorporate the stocker with a few pallets and grow the system as production needs change. Palletech from Mazak is a modular system available in single-, double- and triple-level pallet stocker configurations. It is compatible with a range of horizontal machining centers, multitasking machines and Orbitec 20 machining centers and is well-suited for high-mix, low-volume production as well as high-volume operations common in job shops. Smooth PMC is schedule operation software for Mazak flexible manufacturing systems (FMS) that predicts necessary tools and production output according to the production schedule. Information is displayed in a variety of graphs that enable easy utilization analysis. Floor-mounted articulated robots (with stocker) keep machines running unattended from one job/part to the next. The robots incorporate rotary joints—ranging from simple 2-joint robots to complex 10-joint robots—to complete tasks and gain a competitive advantage. Shops with more sophisticated needs, such as automating multiple machines, part transfers to peripheral operations, or the handling of large and heavy parts, can benefit from customized solutions such as articulated robots.